Ideal for strong, quick water resistant bonds. 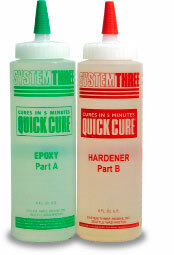 System Three Quick Cure is the standard quick setting "five minute epoxy" system. 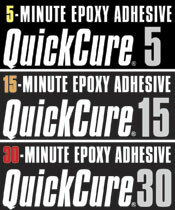 Quick Cure is ideal for all small jobs requiring a strong bond and rapid cure. Quick Cure is highly water resistant but not waterproof. Quick Cure is quite thick, but is easily measured by squeezing equal sized lumps from the convenient application bottles. Also available with a 15 minute cure time, when a little longer working time is needed. Use Quick Cure for installing bungs, repairing missed staple holes prior to fiberglassing, "tack welding" wood, and for those other glue jobs, which require a fast cure. Do not use below the water line unless protected by an over coating like SilverTip Laminating Resin, STR General Purpose Epoxy, Clear Coat, etc. Surface must be sanded and clean, dry and free of oil-based paint, oil, wax, dust and other contaminants. Do not wipe with tack cloth. Ratio by volume is 1 part resin A to 1 part hardener B. Do not alter mixing ratio. Mix the resin and hardener together quickly. Working time is extremely limited. Best results will be obtained @ 75º F. Using brush, spreader or squeegee, apply mixed Quick Cure to surfaces to be bonded.